Imagine the High Line elevate park on the lower west side of Manhattan, only instead of a one-mile walkway above beeping taxis and century-old brick facades, it's a six mile network of walkways spanning over unspoiled rainforest with chirping Toucans and ancient trees over a thousand years old. This walkway, part of a proposed science center designed by Marks Barfield Architects in the northeastern Brazilian province of Roraima, would offer important research opportunities to scientists from the Royal Botanical Gardens and organizations like Kew and the Brazilian Amazon Research Institute, as well as breathtaking views for visiting tourists. Local communities rely on the surrounding rainforest, harvesting Brazilian nuts and rubber as two of their main sources of economic output. However, the CoopXixuaú Co-operative, formed in February 2010 by the local community, hopes this project will give back by attracting ecotourism thus creating new jobs for local tribes and improving the community through economic growth. Solar-powered computer workstations under bamboo pavilions will connect this remote location to the rest of the world. Recent developments of a new school and a solar-powered satellite internet connection are examples of the area’s focus on sustainability and growth. Financier and managing partner of The Amazon Charitable Trust, Robert Pasley-Tyler, says, “This will be the first scientific research center to be built in the jungle proper. It will employ the local river tribe, giving them a way of making a living without destroying the forest, and also boost awareness around the world.” With supporters such as famed explorer John Hemming and former actress and model turned activist Bianca Jagger on board, the center strives to be non-profit and self-financing in the near future. 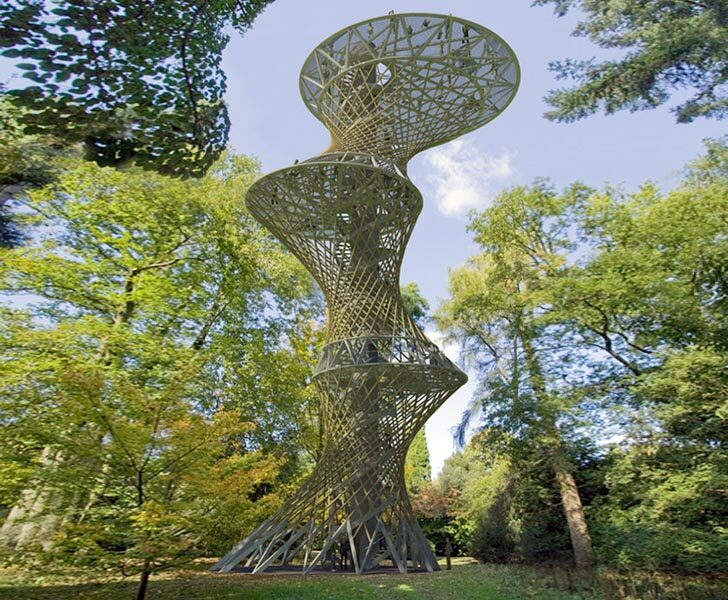 Designed by Marks Barfield Architects, a London-based firm known for progressive landscape designs including the elevated walkway at Kew Gardens, the center will incorporate solar power and will use bamboo grown on-site as a primary material in the construction process. 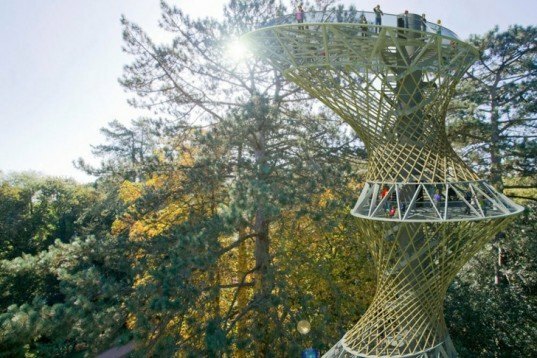 A spiral staircase leads up to a vantage point right at canopy level, giving researchers and visitors alike a rare and beautiful perspective of the rainforests. Recent developments of a new school and a solar-powered satellite internet connection are examples of the area's focus on sustainability and growth. A view of what the walkway high above the jungle floor might look like. Rendering of the interior of a solar-powered computer workstation. Designed by Marks Barfield Architects, a London-based firm known for progressive landscape designs including the elevated walkway at Kew Gardens, the center will incorporate solar power and will use bamboo grown on-site as a primary material in the construction process. Project architect David Marks says of the rainforest's sensitive ecosystem, "You have to be very careful about what you bring in to avoid damaging the ecosystem. Because it is so remote, it also has to be self-sufficient."